My wife and I purchased a home through her father. It was sold as is and was filled with lots of items left behind by the previous owner. 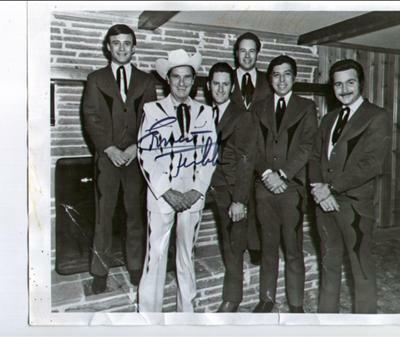 One of the items was this Autographed Photograph of Ernest Tubb and his band. It has Ernest Tubb autograph and band members on the reverse side. I still have the photograph but I am not sure if it’s worth much. I sure would like to know if it’s anything. You might want to contact the Ernest Tubb Record shop – Ernest Tubb Record Shops, P.O. Box 500, Nashville, TN 37202-0500. They may even be interested in acquiring the photo.